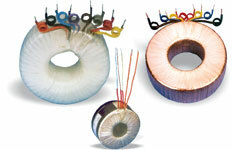 A range of high quality toroidal transformers with twin 115VAC. primary windings and a wide choice of secondary voltages. The primary windings can be connected in series or parallel to cater for 115V or 230V 50/60Hz AC inputs. All leads for both primary and secondary are double-insulated enameled wire with stripped wire ends thereby reducing assembly time. There are no air gaps in the core & no vibrating laminations. The reluctance is low, resulting in very low magnetizing currents with savings in power consumption. A further benefit of this gapless core is the reduced level of radiated electrical noise (hum field). The simple construction of the toroid and the resultant saving in weight as compared to the conventional laminated transformers makes this range particularly attractive for compact power supplies and slimline equipment. Weight of conventional laminated transformer of 1 KVA is approx.12 kg. whereas weight of TOROPOWER toroidal transformer is approx.7 kg. Small size and low weight as compared to traditional stacked lamination type transformers. Supplied with mounting kit having a single hole mounting arrangement. 100% electrical and flash tested. High quality manufacturing and testing. Extremely low level of radiated magnetic field. Allow 5 mm. extra, where leads emerge & for mounting kit. Dimensions/Data are subject to change without prior notice. Twin 115V AC. 50/60Hz primary windings may be connected in series for 230V or in parallel for 115V operation. Twin secondary windings may be connected in series or parallel or can be used independently. Each transformer is supplied with a dished washer, protection pads and nut, bolt and washer for single hole fixing. The pads are to be fitted above and below the transformer winding and the dished washer on top of the upper pad. Under no circumstances should both ends of the fixing bolt contact a metal chassis or frame as this would create 'a shorted turn' causing irreparable damage..
A range of high quality toroidal transformers with one 230V AC. winding and tappings provided as per requirement. All leads for both input and output are double-insulated, enameled wire, with stripped & tinned wire ends thereby reducing assembly time. There are no air gaps in the core & no vibrating laminations. The simple construction of the toroid results in saving of weight as compared to the conventional laminated type transformers. High conductivity copper winding on insulated toroidal core, made of high grade cold rolled grain oriented silicon steel ensures very low magnetizing currents & results in saving of power consumption, making this range particularly attractive for compact power source and slimline equipment. A further benefit of this gapless core is the reduced level of radiated electrical noise (hum field). With Voltages as per customers specifications up to 600 volts max. Also in sheet steel Enclosed or Resincast models. With shield Between Primary and Secondary windings if required. 230 V A.C. Input & 115 A.C. Output 50/60 Hz. Popular voltage tappings 220-240 V A.C. also feasible. Negligible wave form & power factor distortion. Excellent short time overload capacity. Allow 5 mm. extra, where leads emerge & for mounting kit. Dimensions/Data are subject to change without prior notice.